Policing used to be an exclusively man’s job. In the Slovenian police too women were an exception. 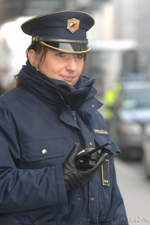 Since 1998 the number of women in the police has been on the increase, which makes us comparable to other European police forces. 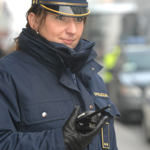 At present, the Slovenian police employ 24 per cent women officers. Despite being under-represented, women are highly successful in a number of work fields: as members of international civilian missions, in traffic patrols, as officers of operation-communication centres, as athletes and in many other areas where the results of their work are not always noticed. They have good reasons to be proud of their achievements, and good results serve as an example and motivation to other women within the police. 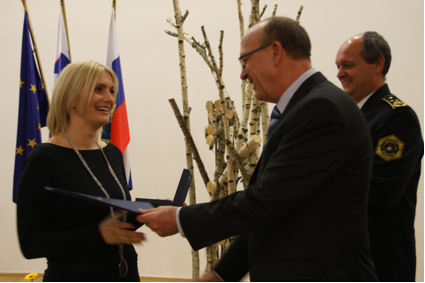 A medal of the Slovenian police for bravery is awarded to police officers, other employees of the Police and other individuals for a special act of personal bravery demonstrated in saving people or property or for putting their lives in danger when performing their duties. In February 2013 a bravery medal of the Slovenian police was awarded to police officer Mirela Čorić, who single-handedly apprehended two individuals who had robbed a jeweller’s shop in the city centre. Given that there were two perpetrators, who had just committed a brutal robbery and there was a possibility that they were armed, her action, which was performed with high professionalism and without hesitation, is all the more admirable. Ljubljana police officer Mirela Ćorić accepts her bravery medal (on the right). A medal of the Slovenian police for selflessness is awarded to police officers, other employees of the Police and other individuals for selflessness demonstrated in saving people or property or in the performance of their duties. Also in February, another woman police officer, Ana Glumac, was awarded a medal for selflessness. With quick, effective and skilful action Ana saved the life of a youngster who was severely injured after falling from the fourth floor onto a tin roof of a house. Had it not been for her presence of mind and expert assistance, the youngster would have bled to death at the scene. 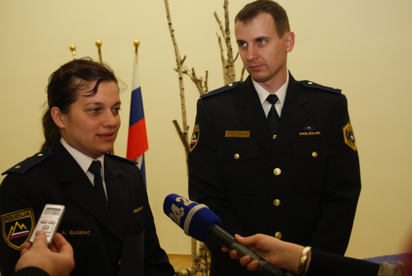 Ljubljana police officer Ana Glumac accepts her medal for selflessness (on the right). On the occasion of the international women’s day, we would like to extend our best wishes to all women police officers.